Was life good or bad in Victorian Britain? The following stand-alone study unit is delivered over 7-8 hours. 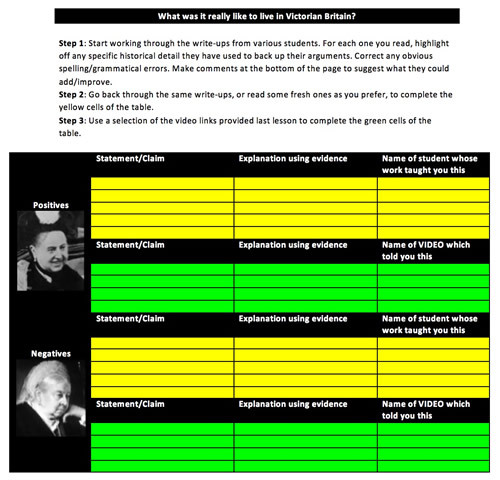 Inspired by the excellent Jeremy Paxman series on "The Victorians", it is designed to develop skills of visual literacy as well as essay writing. 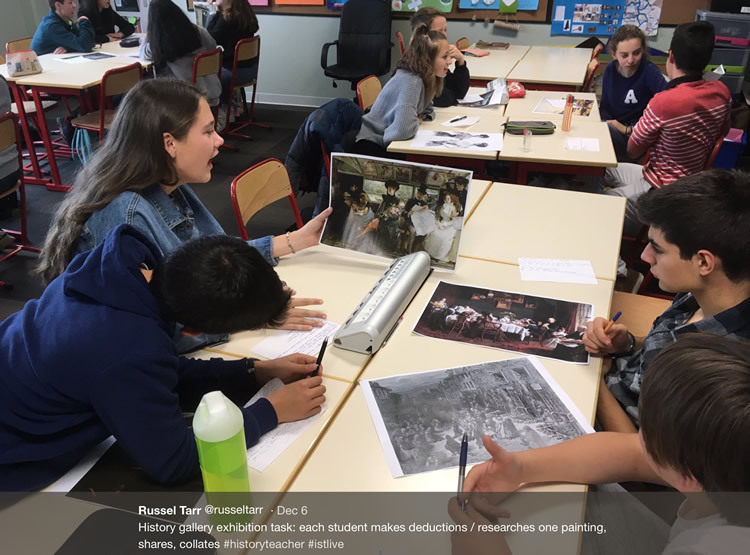 Students draw deductions from a range of Victorian paintings, then test these hypotheses through extra research, categorise their ideas by theme into a gallery, and draw sophisticated conclusions based on opposing viewpoints. The final outcome is a detailed essay on the question "Was life good or bad in Victorian Britain?". Prior to the lesson, have a selection of images on each table. Make sure in particular that the paintings covered in the Paxman documentary are evenly spread across the tables. Each student selects ONE picture to focus on after having a quick look at them all. The teacher should collect in any remaining images for later. When I start my research, I will test whether I am correct by trying to find out..."
The teacher starts by asking one member of each group to stand up, share their picture and give their answers to the questions. Comments / suggestions can be made by the teacher and the rest of the class. Next, the remaining members of each group take it in turns to repeat this process within their teams, sharing ideas and suggestions with each other. Each team then imagines they are responsible for one 'wall' of the exhibition. They have to organise their images into two or three categories, and use this to decide upon a title for their part of the exhibition (e.g. "Work and Play", "Factories and Family" or similar). At the end of this discussion ideas should be shared with the class, who should then watch together the final two minutes of the Paxman documentary (from 56.30) where he ties things together in a similar way. At this stage the groups could be completely mixed up again and the process of feedback and categorisation repeated. Each student now has to write up neatly their answers to the three questions, incorporating any fresh dedictions and research ideas that emerged during discussion. These should be brought to the teacher for approval before they proceed to log on and start further research. 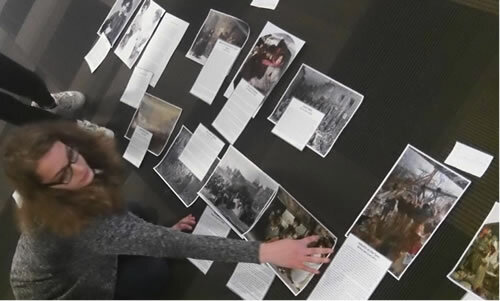 During this phase, students with paintings covered by the documentary could be directed to the appropriate video clip. Download: List of video clips in the Paxman documentary relating to particular paintings used in this unit. If it's a homework night, students should be instructed to complete the gallery panel template prior to next lesson. Whenever the teacher thinks appropriate time has been spent on this phase, students save their work into a shared drive, giving their surname as a filename. Then, each student opens up the work of the person below them in the list of names. Their job is to highlight any clear evidence of contextual information from background research, correct any obvious grammatical errors, and make suggestions about additional things to improve/research further underneath. This process can be repeated several times so that each piece of work is considered by several students. Finally, each student goes back to their own write-up and uses remaining time to develop the piece further so that is the very best it can be. Students need to complete and print off their work as a homework exercise ready for next lesson so we are ready to construct the gallery. 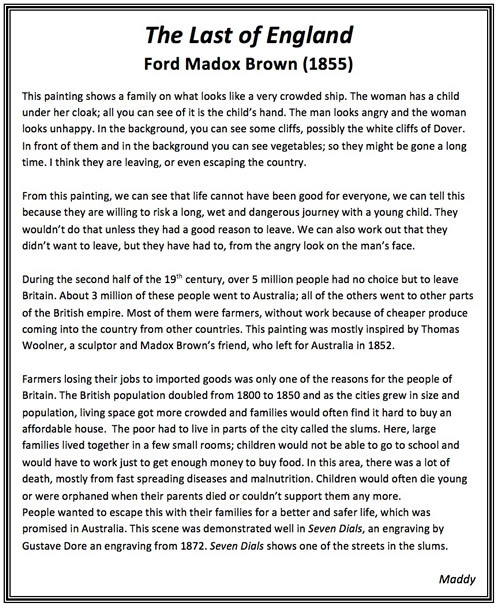 In this lesson, all students complete / print off their completed gallery panel template, and then start work on the 'Was life Good or Bad?' table when they are ready. After 10 minutes, by which time most if not all of the gallery panels are finished, five or six students in the class should be invited to step outside to the corridor with their images and panels, and discuss / agree as a group on how to organise their work into categories, and even how those categories could be connected. When they return to the class they continue with the "Was Life Good or Bad?" task, and another batch of students goes outside to decide how they can incorporate their own work, change the categories, and add fresh ones as appropriate. By the end of the lesson the gallery should be laid out on the floor. 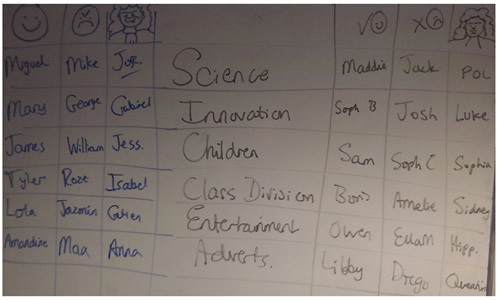 Make a note of the titles of each category and talk it through with the class to ensure they are happy with it. Before the next lesson the gallery will need to be placed on display by the teacher or by student volunteers. "Is it not true that in terms of [theme] Victorian Britain was [good/bad adjective]? This is demonstrated by the fact that [explain your point with evidence]". 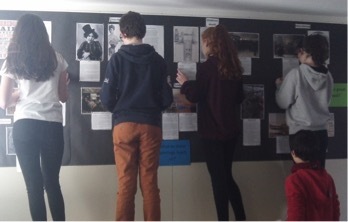 Both teams therefore went outside to look at the exhibition, decide as a team who should focus on which theme, and start writing their question on a scrap of paper and using only the exhibition to help them (note: no computers allowed at this stage). During this period, students are allowed to log on for extra research and detail only as an extension task and when the teacher has approved their handwritten question. Is it not true that in terms of entertainment, Victorian Britain was horrendous, which is demonstrated by the fact that for entertainment they watched freak shows and read "Penny Dreadful" magazines based on the story of Sweeney Todd? Is it not true that Victorian innovation improved and modernised Britain? This is demonstrated by the fact that before the Victorian age many people lived in small villages but after most of the population lived in cities and worked in factories. This is also shown in the “Fighting Temeraire" by JMW Turner which shows an older ship being replaced by a newer steamship which represents how the innovations was changing Britain. Whilst the debaters were outside looking at the exhibition, the judges were given their initial task, which is to "tell us something we don't know" about their allocated theme. The rules, as per the great podcast quiz show, are that the information needs to be true, interesting and genuinely something we didn't know. Therefore it should be framed as a question to the audience ("Do you know how Joseph Bazalgette made London smell nicer?" or similar) and then an answer when the class doesn't know. For 5 minutes, each team should share its findings with their team mates. The debaters should start by comparing the good/bad adjectives they have chosen, with the challenge being to ensure that each student uses a different one ("cruel", "sexist", "unfair" etc). In any time remaining they compare questions and offer opinions to each other. The judges should compare their 'tell me something I don't know' research. Then, the class is arranged into its thematic teams of three, with one judge, one 'good' and one 'bad' member. The judge should start with the "tell me something I don't know" point, before the good/bad debaters present their questions and start a discussion based around them. Using the arbitration format, the objective is to try to reach a conclusion which everyone is happy with - e.g. maybe it was good in the short term/for men but bad in the long term/for women and so on. In other words this is not a competition, but a collaboration towards a synthesis. The class is arranged back into the teams of three from last lesson. "In terms of [theme], our conclusion was that Victorian Britain was [synthesis]. This is because on the one hand... [idea from 'good' debater]. One the other hand... [idea from 'bad' debater]." Make it clear to the students that in the feedback phase, any one of the three team members might be nominated by the teacher to share their ideas and the 'tell me something I don't know' point, therefore they should all work on this together. Then, the teacher leads a feedback session. Start by sharing the "Tell me something I don't know" points and then get the class to vote on the best one based on whether it is something they don't know; whether it is worth knowing; and whether it is indeed true. Then, hear the synthesis statements from each team of three. Students should take notes ready to turn this into a meaningful essay.